Eleven Madison Park has been a popular East Hamptons popup in years past, now the concept arrives in Aspen with the brand new E.M.P. Winter House. Same rules apply: this is open only to American Express members. The main space is a 90-seat dining room that is Swiss-inspired, cozy, and rustic. Chalet dÃ©cor is homey and fun, and blends perfectly with Aspen's ski-focused vibe. The atmosphere is festive and energetic, with many guests arriving directly from the slopes. The outdoor design is a fully-realized â€�"yurt villageâ€ with eight specially made luxury yurts brought in from Oregon. Guests are conducted to their yurt, from which they can summon servers by flipping on Christmas lights at the top of each structure. The menu embraces two themes: winter warmth and luxury small plate dining. Thermoses of bone broth soup are perfect to warm you up after a day spent on the slopes. Truffles and caviar are ideal for making a statement. Oysters on the half shell, lobster salad, and rack of lamb are just a few of the more indulgent items â€“ there's something here for everyone to recharge. Don't go anywhere without your American Express card, especially the new AmEx-sponsored E.M.P. 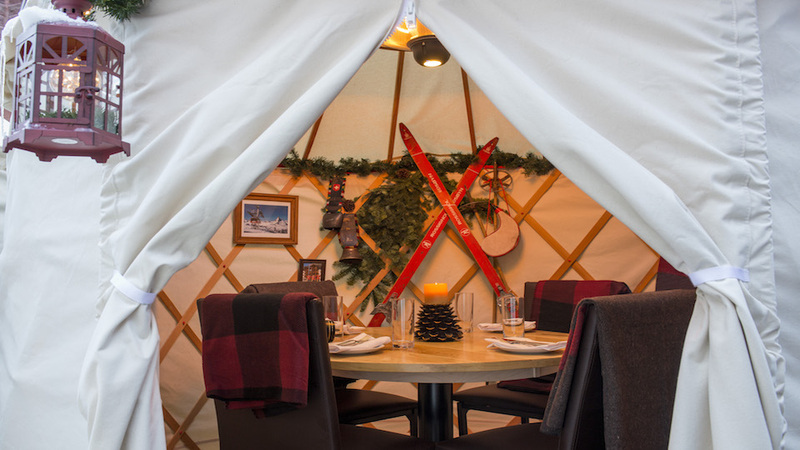 Winter House, where you can enjoy aprÃ¨s-ski festivities in the comfort of your own yurt.